Just hold them both in your hand and allow the two strands to twist together naturally. After a few rows you will hardly notice that you are holding two strands together. Thanks for knitting Building Blocks with me! How do I remove my last name? Video would be great. Is it hard to knit with a double strand? Referring to Moebius scarf I am in a class where we are doing the build a block afghan I am a novice. Your videos are great. If using 2 strands, should they be twisted together? Maybe now I can learn to knit…thank you! It works up quicker. You can single strand if preferred. Hi, great looking scarf. Why is it double stranded? Ok, I came home tonight and could barely put it down. I guess I am hooked! 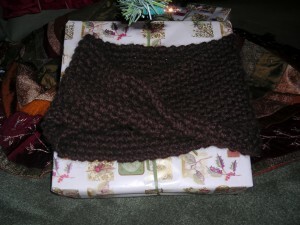 I was glad to read this post, I am a beginner knitter and thought I could knit 3 scarfs for my daughters for the holidays, well they didn’t get done. I’ll remember chunky and bigger needles for quicker projects.